Here’s some good news to start your October right: Meralco recently announced lower energy rates for the third straight month this year! Residential customers get to enjoy a 12-centavo rate reduction per kilowatt hour (kWh), which means that average households with a monthly consumption of 200 kWh can enjoy Php 24.00 off their energy bills. Meralco, the country’s leading power distribution company, mentioned that the recent rate reduction was caused by lower generation and transmission charges. International Energy Consultants (IEC), an Australian consulting firm specializing in Asian power markets, showed in a recently released survey that lower tariffs for Meralco over the last four years have closed the power-rate gap between Luzon and other countries. The IEC observed that lower fuel costs have significantly contributed to the lower energy rates that we enjoyed this year. Since August 2016, Meralco has announced lower power rates for its residential subscribers. 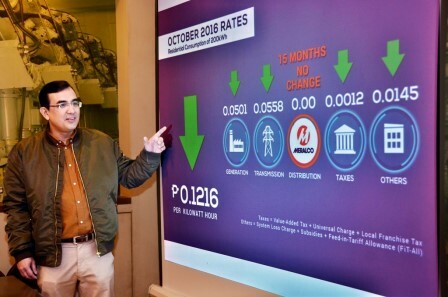 Dr. John Morris, the IEC survey’s proponent, also mentioned that a more efficient sourcing strategy by Meralco, lower distribution charges, and lower system loss played major roles in bringing power costs down for Meralco subscribers. Morris noted that Meralco subscribers were able to save a total of P30 billion in energy costs because of these three factors.